An inline grip and compact design make this 4V MAX* cordless rechargeable screwdriver ideal for tackling a variety of household tasks. Comfortable to use and fits in tight spaces. Optimized for the professional who frequently encounters precision fastening applications, the Milwaukee M12 Hex Screwdriver delivers unmatched precision, power and portability along with a slimmer, more ergonomic grip. A variable speed trigger and 0-500RPM give the user unrivaled fastening control, 15 plus 1 clutch settings prevent over tightening fasteners and 175 inch/lbs. of torque provides the ability to accomplish tough applications. At 6-1/2 inch long and weighing only 2.0 lbs., its compact, lightweight and durable design provides greater comfort and fits in tighter spaces on the jobsite. The onboard LED light and fuel gauge help you increase productivity and avoid interruptions. 2 belt-clip positions for both left.- and right-handed users and one-handed bit changes provide maximum ease-of-use. The REDLITHIUM Battery Pack delivers more work per charge and more work over pack life than the competitors. The M12 FUEL 1/4 inch Hex 2-speed Screwdriver delivers longer productivity in a compact size. This 2-speed screwdriver provides up to 10X longer motor life, 2X more power, and 2X more runtime. The POWERSTATE Brushless Motor outperforms all leading competitors with constant power output, yet runs cooler with no wearable components. The REDLITHIUM 2.0 Compact Battery Pack (sold separately) delivers up to 20% more power and 2X more recharges than standard lithium-ion batteries, as well as best-in-class performance in extreme jobsite conditions. The onboard fuel gauge helps you monitor the charge more accurately, so there's less downtime on the job. REDLINK PLUS intelligence ensures maximum performance and protection from overload, overheating and over-discharge. Its compact size allows users to work in tight spaces. The built-in LED worklight illuminates work surfaces in dark work spots. 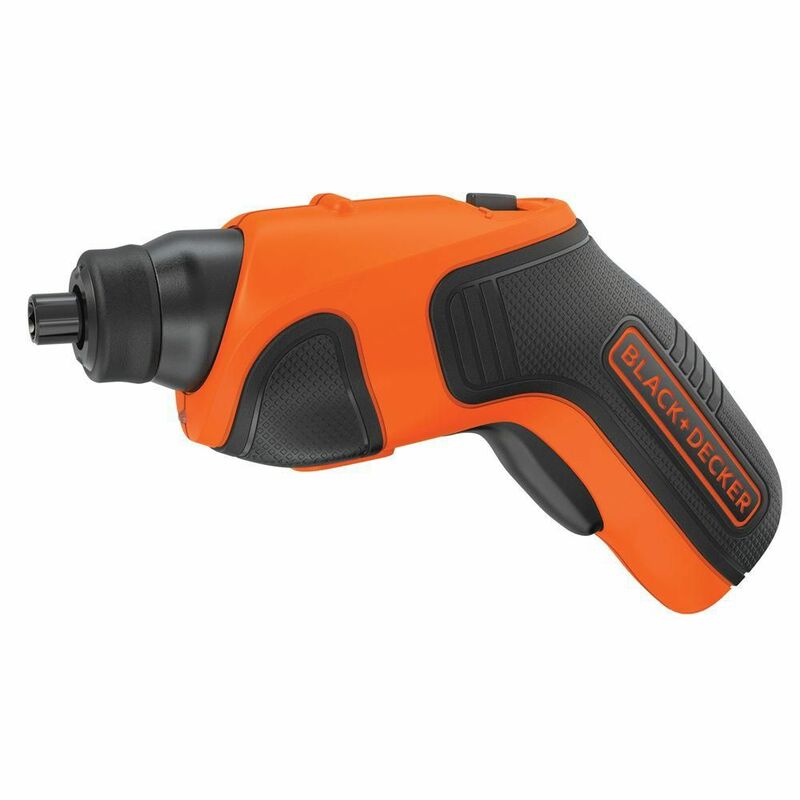 4V MAX Lithium-Ion Cordless Rechargeable Screwdriver The BLACK+DECKER 4V MAX* Lithium Cordless Rechargeable Screwdriver features a compact handle and a powerful 180 RPM motor for easy driving and removing of screws in tight spaces. Its inline trigger grip provides comfort and control when installing mini blinds, hanging curtain rods, assembling furniture and a variety of other household tasks. The unit is also attachment capable, allowing for compatibility with all of BLACK+DECKER's future attachments. 4V MAX Lithium-Ion Cordless Rechargeable Screwdriver is rated 4.3 out of 5 by 114. Rated 5 out of 5 by Screwdriver from Perfect! I should have purchased this years ago. Perfect! I should have purchased this years ago. Rated 5 out of 5 by Mrfixit from This screwdriver is very compact. I was surprised by how it could be used as a drill. Great for q... This screwdriver is very compact. I was surprised by how it could be used as a drill. Great for quick fixes around the house. Very ergonomic. Highly recommend. Very satisfied. Rated 5 out of 5 by Dave from Plenty of power for those quick jobs around the house. Plenty of power for those quick jobs around the house. Rated 5 out of 5 by Al from I buy it for work and the price is nice. I buy it for work and the price is nice. Rated 5 out of 5 by Diane from My order was quickly received and just what I needed!... My order was quickly received and just what I needed! Will it take drill bits? This particular product will not take drill bits.